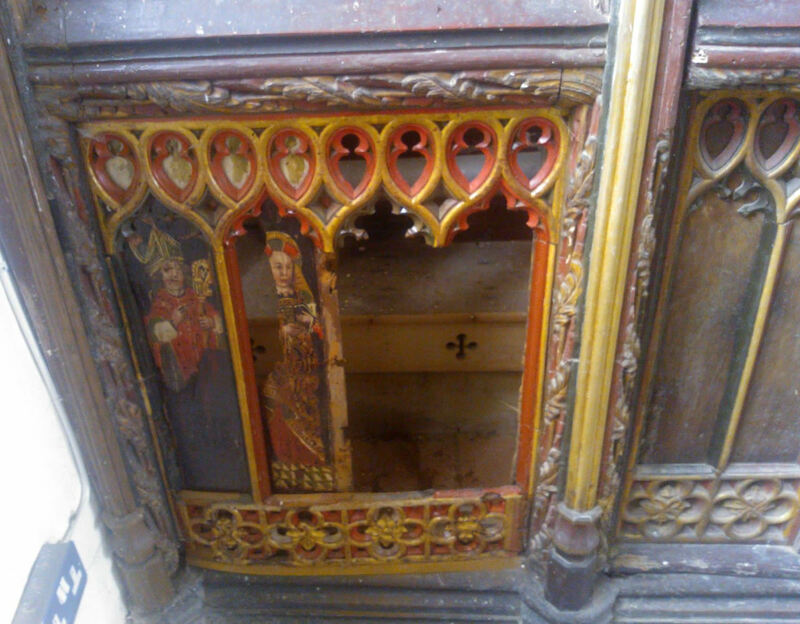 Thieves stole two painted oak panels from a rare 15th century rood screen in the Holy Trinity Church in Torbryan, Devon, southwestern England, sometime between July 22nd and August 9th. The two stolen panels depict Saint Victor of Marseilles and Saint Margaret of Antioch in rich jewel tones and gold paint. They were pushed out of their casings from the front and somehow, an adjacent third panel of an unknown female saint was also damaged, leaving a large shard missing from the left side. Rood screens are large tracery partitions, usually the width of the church, that separate the nave (the main part of the church where the parishioners attend services) from the chancel (the front of the church where the altar is). They were made of wood or stone and were elaborately carved and decorated. This was a common feature in late medieval churches, but most of them were destroyed during the upheavals of the Reformation and under Cromwell because their decorative elements, especially figurative painting like the saints on Holy Trinity’s rood, were seen as idolatrous and because the partition represented a Catholic hierarchical divide between priest and church-goer. Holy Trinity’s piece is a rare survival and one of the best examples remaining, which makes the loss of the panels particularly painful. The rood was built between 1460 and 1470, carved in elegant peaked Gothic arches that mimics the tracery of the stained glass windows. At the bottom of the structure are 40 oak panels 17 inches high and six inches wide, each painted with different saints and dignitaries of the church, some of whom have no other known surviving medieval representations. The quality of the painting is very high, probably the work of a master craftsman. There is evidence that the images were once whitewashed, which might explain how the rood survived the iconoclastic zeal of the Tudor and Civil War eras. Parts of it — the painted wood screens inside the arches rather than panels at the base — were removed and either destroyed or recycled to construct a pulpit that stands in front of the rood. The entire church is a gem of historical preservation. It was built in its entirety in one two-decade effort between 1450 and 1470 and wasn’t subjected to later additions to alter its character. Its high medieval design and many original elements — even the original 15th century oak benches are still there, albeit encased in later box pews — have garnered it a Grade I listing, a designation that marks it as a building of exceptional historical interest. 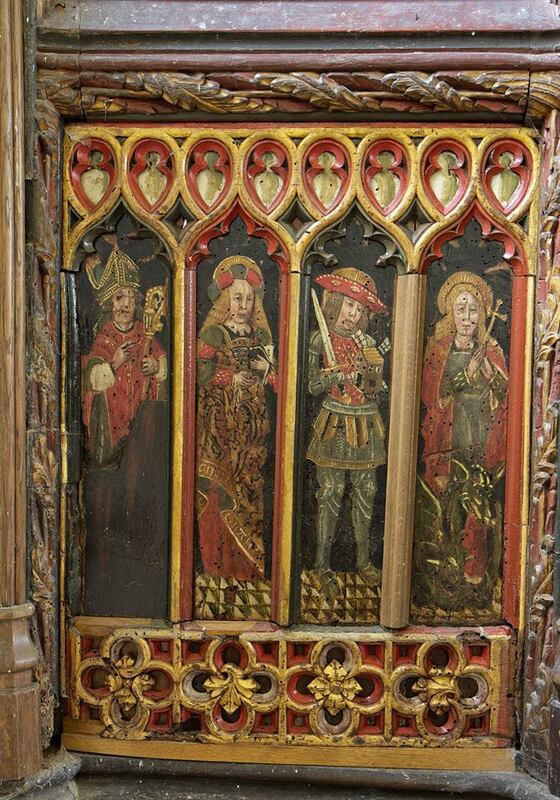 Sadly, this isn’t the first time the rood screen has been the target of art thieves. Four of the saint panels were stolen in the 1990s and another three were ripped off in 2003. None of them have been recovered. 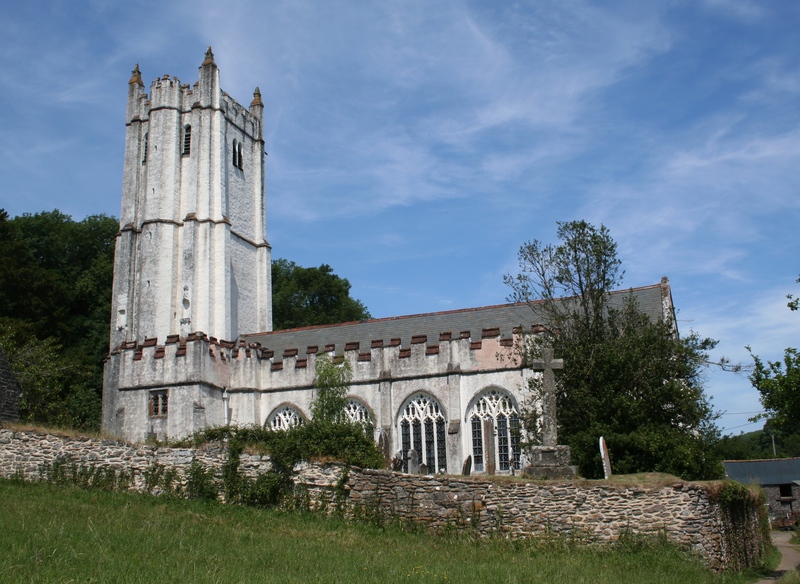 The Church of England gave the church to the Churches Conservation Trust (CCT), a national charity that cares for 340 at-risk historic churches that are no longer in use as parish churches, in 1997. It is still consecrated ground, but now it is dedicated primarily to tourism and special events. CCT churches are maintained exclusively by volunteers and needless to say, there is no money for security or monitored CCTV cameras. The church is open to the public during the day, and the key is kept by a neighboring volunteer. That’s why they don’t know when exactly the theft occurred. A maintenance contractor noticed the missing panels and alerted the trust. Whoever stole them is unlikely to make much money from them. All auction houses, galleries, museums and antiques dealers have been alerted to the theft. They won’t want to touch so unique a property, especially since the thieves chose two rarely seen saints instead of more obvious figures. CCT chief executive Crispin Truman fears the panels will wind up being sold in some grubby back alley deal for a tenner. Their value, which is incalculable because of their rarity, lies in their proper context: the rood screen in Holy Trinity Church. Unmoored on the black market, they are unlikely to bring in a big price. The Devon and Cornwall police have launched an appeal for information about the missing panels. They believe the pieces may have been taken out of the county in an attempt to sell them somewhere where they are less known. Thanks to all the publicity, police think that any attempt to sell them in the UK will be thwarted at this point, but they could be shipped out of the country or worse, dumped in a gutter somewhere that they’ll never be found until they decay beyond retrieval. 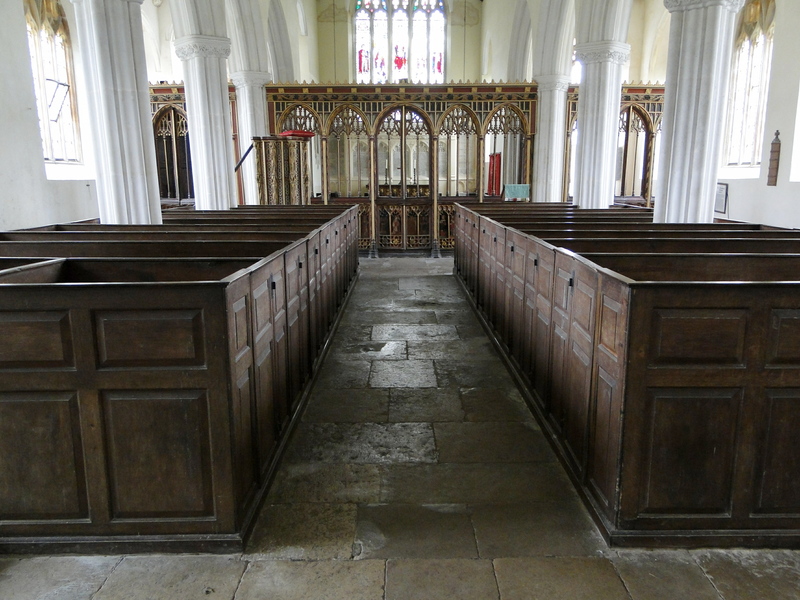 The CCT asks that anyone with information about the panels contact Laoise Bailey at lbailey@thecct.org.uk, land line: +44 (0)20 7841-0415, cellphone: +44 07831 873-515. They have received many calls already from the general public and from art dealers so let’s hope one of them results in the return of these precious medieval artifacts. This video shot in 2011 is a walk through the church. You can see the thick wooden doors, the rood screen, the pulpit, the pews, the windows, the vaulted ceiling and just the overall loveliness of this 15th century treasure. EDIT: The video has been marked private and is no longer viewable.